Based on the passenger list from Havana (Cuba), the family arrived in New York on 14th August 1923, and were in transit for 10 days before sailing for Australia. On November 17, they arrived in Burnie (Tasmania) coming from Melbourne on S.S. Oonali. On December 6, they sailed from Hobart (Tasmania) on S.S. Moeraki, heading for New Zealand. On all the above, they were accompanied by Alfredo and Emerita Egochago, and 'Egochago' appears regularly on the bill with them. Here are some dates and places where they performed between 1924 and 1929, using various names for their acts including The Zanettos. I have included a description from some of the advertisements, as well as a few reviews. October 19 Melbourne Among the new clowns are the Alfredo Egochago troupe from South America, who stage burlesque Spanish bullfight in which small dogs fitted with horns take the place of bulls. A musical "turn" by Egochago and Carmella is entertaining, and Williams and Palomar also provide amusing interludes. / The Carmelle Trio, another of the new "acts," are sensational jugglers of a high order. but also as The Palomar Family and Miss Jessica! 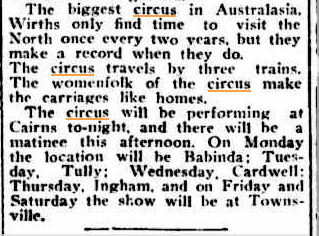 In 1914, Jessie wrote about doing 3 or 4 shows a day, which is what they must have been doing in Australia with their various names and acts. 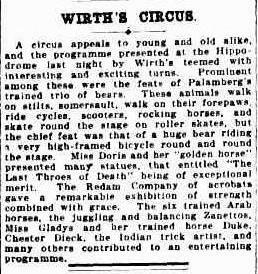 The menagerie was clearly an important part of Wirth's circus, no doubt explaining why the Palomars had acts with dogs in the earlier reports. Having said that, dogs were part of the act for the 3 Gamons and for Frank Bale (The Bognor Clown), Arthur Bale (Professor Lerrano) used pigeons, and dogs, monkies and birds feature in many of the Bale family photos and stories. 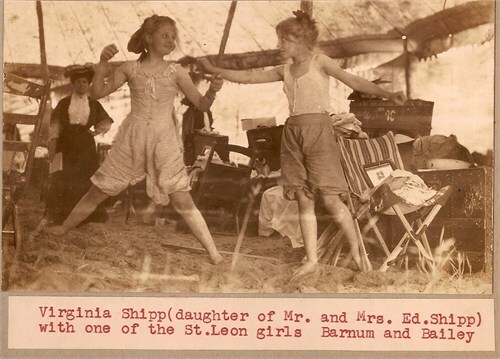 The photo below is from Mark St Leon's collection, a wonderful period scene in the daily life of circus people. On 20th June 1929, the following interview was published in The Register News-Pictorial, Adelaide, Australia. The reproduction is not very clear, so I have added a transcript below because it portrays Jessie and her life so well. A community under canvas. To the average person used to well-ordered homes, regular routine, and cosy firesides, the life of a circus does not sound inviting. But the circus people love it. 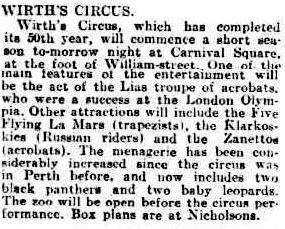 "It satisfies the wanderlust," said Mrs. Palomar, mother of the two child acrobats in Wirth's Circus, which arrived yesterday. Mrs. Palomar has spent 12 years wandering round the world with the circus, and she still prefers it to any other life. "Of course, there are all sorts of hardships to put up with," she said, as she began to unpack the big travelling trunk, which was like a collapsible wardrobe. "But one gets used to them, and there is the advantage of seeing fresh places and countries every now and again." "I have been to Spain, to Mexico and North America, to Britain, and to many queer corners of the earth. Everywhere there are people different from the last. Customs change, and colours, too. "You don't bother to follow fashions very closely in a circus. As long as you have some serviceable travelling clothes, that is practically all you ever have the chance to wear, because, for the most part, there is only the show to dress for." The wind was creeping icily under the flapping tent as Mrs. Palomar hung tinsel frocks over improvised hangers. She laughed as I shivered. "That breeze is nothing to the blasts we sometimes have. There are no radiators or artificial warmth of any kind, unless someone takes a stove with them, which doesn't often happen. "We travel the road all night, and set up tents in the daytime and prepare for the night's performance. Circus folk are mostly of a roaming disposition, and in this show there an unusual number of foreigners. "If you happened to be round the dressing tents just before the performance, you would hear a babble of chatter in Italian, Spanish, Norwegian, German and French, and a small percentage of English." Mrs. Palomar is English, and her husband is Spanish. They have been with Wirth's for 5 1/2 years. "When we first came to Australia," Mrs. Palomar told me, "Jessica and Leonora could not speak a word of English. Now they never speak Spanish." The little girls, whose ages are 12 and nine years respectively, were asleep all the afternoon. their mother told me that the children's routine hardly ever varies. In the mornings they do an hour's physical exercises to keep them fit for their performance in the evening. Then they have lessons, as they are students of the correspondence school in Sydney. In the afternoons, they sleep. The children are making very good progress in this way, I believe, although, until they mastered English, they found lessons difficult. On the other hand, their knowledge of geography and history is more advanced than the average. When they were in Sydney, the correspondence teachers took great interest in the little acrobats, and conducted them over several factories, afterwards instructing them to write essays about their visits. Jessica, the elder, is at present practising a somersault on wires. So far, her parents do not consider that she does it perfectly enough for the show; but, when she can, she will be the only child in the world to do it, says her mother. Mrs. Palomar declares that neither of the children has had any accidents or been hurt through their acrobatic performances. They have not even been scared. "We are too careful for that," she said. 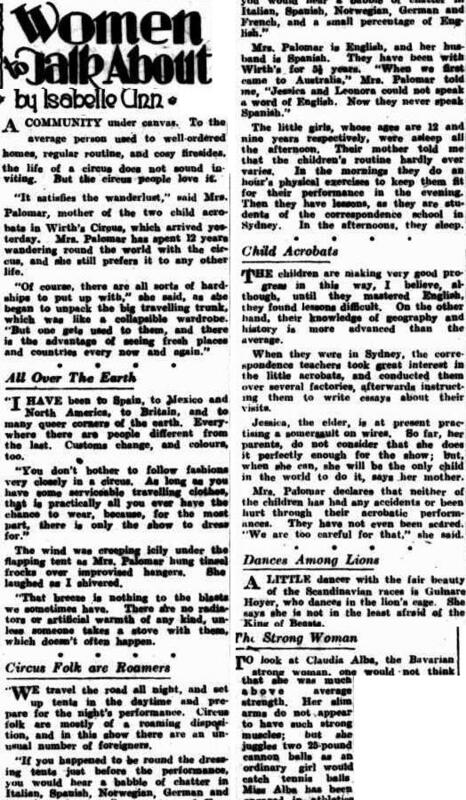 However, in April 1931, The Palomar Family were performing with Harmston's Circus in Singapore (see "Jessie: Singapore and Changi").